Located upon an admirable town site, and commanding by far, the most beautiful views, and delightful panoramas of scenery on the Port Orchard Bay, lies the growing and thriving county seat of Kitsap County, Sidney-which is more widely known by its post office designation Port Orchard- The people are congenial and hospitable, and come here to find a pleasant and profitable place to live. The first homestead was made in 1873 by Robert Campbell at the corner of Sidney and Bay (Olympic Bike Shop). Sidney Stevens, an inventor from Illinois, landed at Mitchell Point in 1885 to visit his wife’s sister, Susie Cline. He envisioned a town west of Blackjack Creek and bought the land for $900 on October 10, 1885. He returned home to Illinois and the following year, his son Frederick came from Illinois and platted the town, named the streets for family members, and christened the town Sidney for his father. Settlers in the community were few, but there was soon an influx moving to the area. The Cline families and Sroufe family moved in from the Long Lake District where they had homesteaded in 1883-84. Henry Cline started the first store just west of the Brick Hotel. The post office was secured in 1888. Henry Cline was the first postmaster. 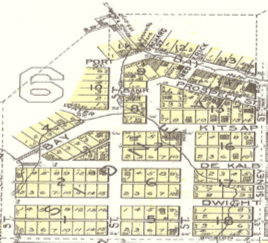 The town was incorporated in September, 1890, in Slaughter (now Kitsap) County, the first Kitsap County city. By a popular vote among 1,386 residents in the county, Sidney became the county seat in 1893. The people of the community paid for and built the county court house building and donated it to the county. Thomas Cline built the first wharf in 1889. 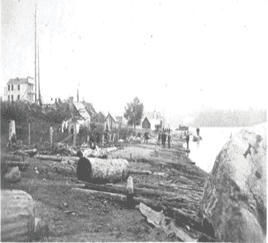 Streets were graded and business “grew with phenomenal rapidity.” The naval station was located in Bremerton in 1892. Then, in 1885 the entire business district was almost destroyed by fire. Sidney became Port Orchard in 1903. The name of the main thoroughfare became Bay Street as it originally edged along the waterfront. Much of the hill had to be excavated to erect buildings on the “land” side of the street. Structures on the “water” side were actually built on pilings over the water. In 1901, there were two churches, excellent schools, and lodges of Masons, Eastern Star, Odd Fellows, Knights of Pythias, woodmen, Woodcraft, and Good Templars. The Sidney pier is still in use, with the marina park nearby. Marine access is no longer available from Frederick and Harrison streets. The two story cabin was built by Allen Bartow in 1914 from “log boom” logs that were pulled up Sidney from Port Orchard Bay hill by oxen and draft horses from Port Orchard Bay. Bartow was a Civil War veteran, a newspaper man, and a retired Indian agent for the Suquamish reservation. He built the cabin for his wife Louse. The building was saved from destruction by the Sidney Museum and Arts Association in 1971. It features vinettes of life in Port Orchard at the turn of the century. 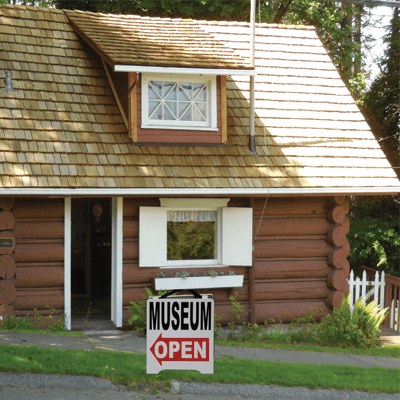 You’ll want to visit the Sidney Museum and Sidney Art Gallery. This is the only building in Port Orchard that is listed on the National Historic register; and, on the State of Washington’s list of historic places. 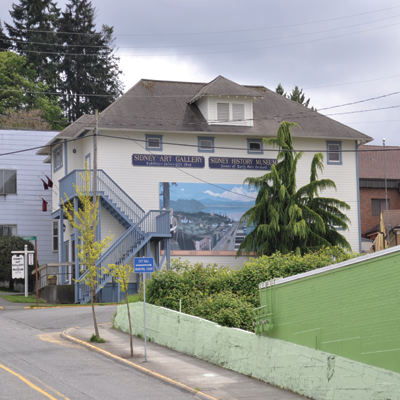 It was built in 1908, and was originally used as the first Port Orchard Masonic Temple. 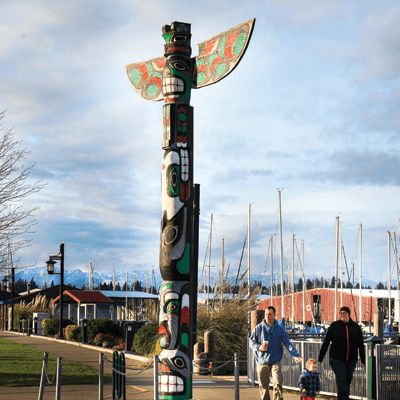 Located just west of the ferry pier along the walkway in the Port Orchard Waterfront Park is the Ha Tu Ba Di Memorial Totem. 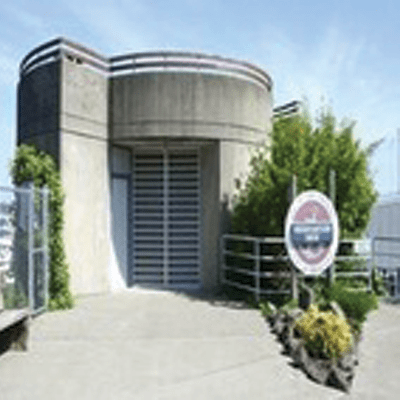 At the west end of the marina is an obsevation tower where you can see out over the water to Bremerton, and the Olympic Mountians. Take the foot ferry to Bremerton. The Carlisle ll is one of the last remaining boats of the mosquito fleet still in service. It has shuttled people between Port Orchard and Bremerton for more than 70 years. East of the ferry pier is Port Orchard Marina Park and Huntingtons Childrens Park, locally known as the “spinny” park. On display is a wonderful collection of military memorabilia from the civil war to the war in Afghanistan. There is an impressive display women’s uniforms, and other items related to women’s important contribution to our country. The Knights of Pythias build a meeting hall at 820-822 Bay Street in 1924.. The first floor was leased as a movie theater called the Community Theater. In 1928, the theater was purchased and renamed the D & R. The theater was completely refurbished and remodeled and a gala grand opening was held on May 5, 1928, with the showing of West Point, a “snappy, scrappy always happy” film of football, romance, and military life with William Haines and Joan Crawford in the starring roles. It also gained a neon sign, which was was new technology at the time. The D & R was closed in 1965 and stood empty until 1980 when a group of 13 Port Orchard businessmen purchased the building from the Knights of Pythias and remodeled it. This included glass doors, aggregate paving in front, a new ticket booth, seats, curtains, and a chipped marble surface in the entrance. Used seats are from Seattle’s Northgate Theater. In 1996, one of the businessmen acquired sole ownership of the building and theater and ran it until 2005.. It reopened as the Orchard Theatre in 2007 and closed again in December of 2010. 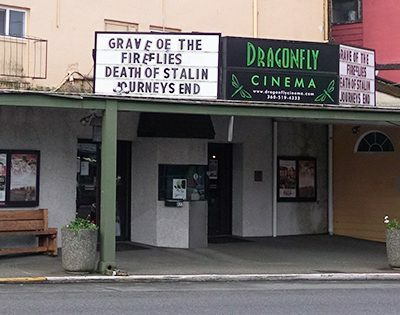 In 2011, the Dragonfly Cinema opened. The new owner of the cinema took over in January 2016. Not far from the Waterfront Park is the public boat ramp at Water Street. It was updated by the Port of Brememrton, and the City of Port Orchard.